4 special stamps were published. Olympic postage stamps, values 20 and 12 Fmks, were on sale from Nov. 16th 1951. The emblem on the 20-mks stamp, designed by G. A. Jysky, was the Olympic Stadium. On the 12-mks stamp, designed by Aimo Ronkanen, the emblem was a swimmer in the act of diving. 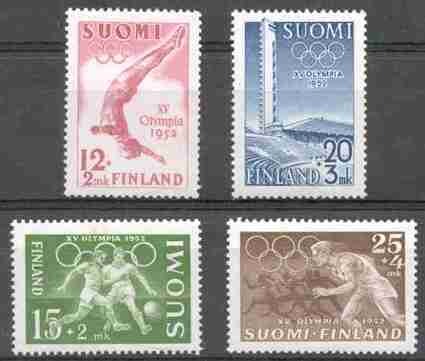 On Feb. 15th 1952 25 and 15 mks stamps were issued, designed by Tapio Wirkkala, the emblems being, respectively, footballers and a runner. Two million stamps were issued for sale of each denomination. In addition 150 000 booklets containing four of all four stamps were printed. The booklets were on sale from May 15th 1952. A special Olympic printer was used on all competition days for date stamping mail deposited in boxes reserved for the purpose at the General Post Office and the temporary post offices. According to custom, arrangements were made for philatelists to obtain first date-markings.